Join Martz for a fun day full of shopping and food at the Tanger Outlets in Hershey and then try your luck at the Hollywood Casino ! Our first stop will be The Tanger Outlets, we will arrive between 9:30am and 10:00am. You will have free time to get something to eat and browse the over 60 stores ! Many of the shops offer up to 70% off your favorite brand-name and designer items !! We ask you to return to the bus at 12:15pm and we will then head to the Hollywood Casino in nearby Grantville. We should arrive at the Casino by approximately 1:00 pm. 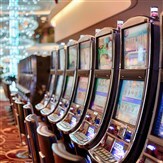 We will spend 5 hours at the casino, giving you lots of free time to enjoy the 2450 reel, video slot, and video poker machines and over 50 table games and 16 poker tables. We will depart the Casino at 6:00 pm to head home. Rebates $30.00 in Free slots play/ $5.00 of the buffet.